This study evaluated the influence of adrenergic factors on the cortisol response to maximal exercise in endurance-trained men. 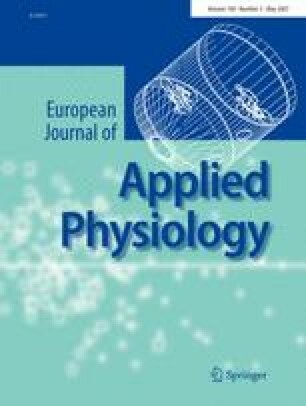 This was achieved by testing healthy young men during exercise while varying both the condition of β-adrenergic blockage and the presence of a well-controlled simulated competitive environment to simulate activity of the sympatho-adrenal systems. Subjects (n = 10) performed maximal exercise (running) to exhaustion on a treadmill during four conditions: (1) placebo non-competitive [PNon] (2) after administration of 80 mg propranolol non-competitive [βNon] (3) in a simulated competition after a placebo intake [PCom], and (4) in a simulated competition after propranolol intake [βCom]. Blood samples were obtained before (pre-) and 3 min after (post-) exercise and assayed for cortisol (C). The data were analyzed with a multi-factorial repeated measures ANCOVA procedure. Statistical analysis revealed a significant three-way interaction for the drug versus competition versus sampling time effects (P < 0.05). Post-hoc tests revealed that the pre-exercise cortisol values did not differ significantly among the conditions. Cortisol did increase from pre- to post-exercise in all experimental conditions (P < 0.01), and the magnitudes of increase in the PCom, βNon and βCom conditions were greater than that of the PNon condition. Furthermore, the cortisol increases for both β-blockage conditions post-exercise (βNon, βCom) did not differ from one another (P > 0.05). The findings suggest β-adrenergic blockage and competitive conditions enhance the exercise cortisol response. In combination, however, these conditions do not act in an additive fashion. This suggests that perhaps there may be two separate influences or mechanisms (i.e., excitatory, inhibitory) on the adrenergic control of adrenocortical function, or a sympathetic compensation for β-blockage during exhaustive maximal exercise. Furthermore, the data suggests a possible “ceiling” on the hypothalamic-pituitary-adrenal axis response to exercise in endurance-trained men.